2018 NTRA Winter Nationals Entry List is now OPEN!! Cars will be qualified by running one run in each lane. The faster ET will be used to calculate your dial in. The racer will then have an opportunity to choose a % between 0 and 5 to subtract from their Qualifying ET for their Round 1 dial in. Example: With an ET of 1.00 the racer has a very consistent car so he chooses 1%. The dial in would be .99, or if the car isn't as consistent he might choose 5% which is .95. The object is to have your car run as close to the dial in as possible WITHOUT going faster. That is called "breaking out" and you lose. The dial in for both cars will be inputted into the computer and the timing system will stagger the start. The slower car will leave first by the difference in the two dial ins. Example: Car 1 has a 1.00DI and Car 2 has a .75DI. Car 1 will get the green light .25sec before Car 2. The idea is to have both cars cross the finish line at near the same time. A good Reaction time...a consistent car, and a little strategy wins the race! If a racer does not choose a %, the Racemaster will automatically apply 5%. Racers can also choose a % to apply to every Round. You decide what you want to do. The race will progress through every Round using the ET from the previous Round to calculate dial in. Everybody will be able to see what their cars are going to do here at Bear Creek after Qualifying. Both Qualifying ET's will be posted. Track prep, voltage, etc will be monitored throughout the event to keep both lanes running equal. If anybody has ANY questions, feel free to ask. Either post it or send me a PM. Hi, I would like to enter the meeting. 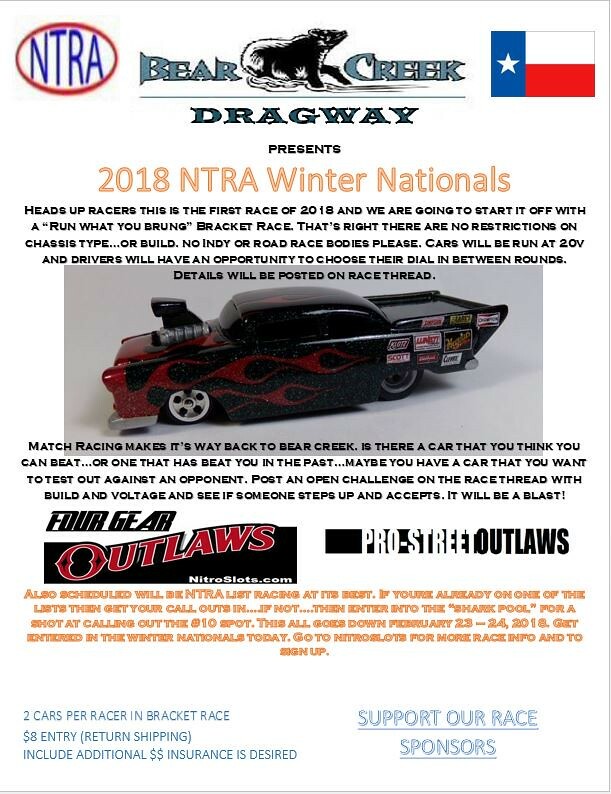 As you know I am new to drag racing so could you please explain the bracket racing rules for me. Any car can be entered in a bracket race since you dial in, (enter whatever ET number you think your car can run). Then you get to go whenever the green comes on in your lane. Ex: If you dial in a .600 ET and your opponent dials in 1.000 he get to go .400 seconds before you. Then theoretically they should cross the line together if they have the same reaction time. It is a lot of fun to race this way and I found it tricky to wait when HO drag racing as you hear the other car leave and it seems natural to want to react and go. In full size drag racing it was not as difficult. In the last bracket race I held the fastest car entered raced against the slowest in the final so any car can win. Thanks Dave, Now I understand, I had not heard the term before. I'm glad to here you will be sending some cars.Dave has already done a great job of explaining Bracket Racing, but I will be posting more info. with a little more detail about the race this weekend. With Bracket racing it is all about Reaction time and ET consistency. Literally anybody can win. Thanks. This may be a silly question to you but would you class a Bill Thomas Cheetah as a muscle car? I really have no Dog in this fight but would like to say the Bill Thomas Cheetah not only the coolest slot car ever in all scales but also the reason the DOG started slot car racing in the 60s and he still has copy in all scales. I agree most definitely. It is my favourite American sports car of all time and I have just cast one to fit a magnatraction. I would love to race it in the US for the first time. I will say yes Clive......you can send whatever you have and it will be considered an musclecar while it's here . I guess that means you will be going for the Pro Street Outlaw list as well as running in the Bracket Race?? You can enter up to two cars in the Bracket race, but only one car can race on the lists. If you have a 4 gear chassis you can also enter that car for the door slammer list. I have one HO Cheetah, it has a blower sticking out of the hood. I also say welcome to it. My bracket entries will be of the 55 & 57 Chevy type. Cheetah? A small car with a big engine, sure sounds like a muscle car. It was always one of my favorite slot cars and a good racing body. Oddly the real Cheetahs had a rep of being very hard to handle. Racers request the numbers you want and I will get you on the list. 2 entries per racer in the Bracket Race. Match racing is always a blast! Is there a racer that just seems to have your number...or barely beat you in another race...or maybe you have a car that you want to test the waters with...or maybe you just can't get enough drag racing and want to see more?? Just throw out an open challenge or challenge someone specifically. State the chassis, build , voltage and we will get it done. Entry list and race details are being posted on page 1 of this thread. I will provide rules links, List race details, etc. there. This is the first NTRA proxy race of 2018!! Let's kick it off in a big way. Bracket and Match racing are easy to enter. No class rules on chassis or build......basically run what ya brung! Still lots of time!! Pro Street Outlaw and Four Gear Outlaw List race #1 for 2018 will be taking place at the Winter Nationals!! Get you Call Outs posted! Races will be run in the order the call outs are posted. I will honor any call outs posted on the race thread or the Official Call Out thread. If you are not already on one of the lists and want to give it a shot, just say the word and you will be entered into the "Shark Pool" for the list of choice and have an opportunity to challenge for the #10 spot. I am sure we are going to have some no shows for both lists, so just the first few racers should be automatically placed on a list just by entering. I will be posting more details on chassis, build, body, rules, etc. on page 1 of this thread. If you're not sure what to do....we can help you. 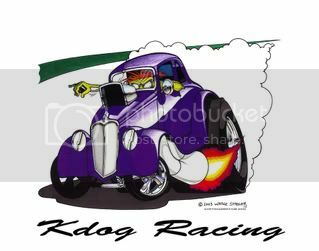 It all goes down 41 days from today at Bear Creek Dragway!! 2 for the bracket race, 1 55 and 1 57 Chevy picked for consistency and reaction times. My list cars will be there! #1, Would like to challenge anyone to a race with the new Jag TR/DR chassis, any body, stock motor mags and arm, anything else goes, 20 volts. Robert already has one running strong. T jet, anything goes 20 volts. Hope there are some brave souls there. I plan on making a little Jet Frankenstein monster. Please put me down for 2 Bracket Races. PSO & 4GO cars will be returning to defend their honor. Last time they were backing up like their chutes deployed at the starting line. Hope to find the speed that was lost. Looking forward to some match racing. There were several events were my cars had some really close heads up racing with a few competitors, that was a lot of fun. Seems like Hilltop, Nosub and Kiwi were a few of them. Will have to do some research to find out the chassis, class and voltage. It would be nice to see a few of our friends who couldn't make the last few events, back in action.